My first foray into promoting house music in Ottawa is coming up on April 30th at the Mercury Lounge. Going to be a great night of music and for a good cause. A portion of the proceeds are going to be given to Peace Voice, organization that assists in conflict resolution and the promotion of respect for the world, it's cultures, and inhabitants. 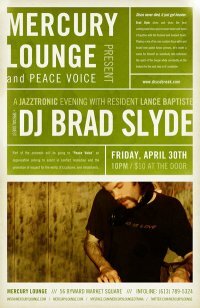 The DJ for the night will be Brad Slyde from Montreal. If you want to know more about him, visit his site Disco Break but I can guarantee that the music will be everything from disco to house and I am certainly looking forward to hearing what gives us but you can download his mixes here. I drove to Toronto and then onto Guelph this weekend for a friend's stag and doe. Normally, drives of that length would be insanely boring but I was able to download a bunch of archived shows of my favorite podcasts. I tweeted about this episode of The Beancast (link directly to mp3 of it here) and I can't say enough about how much I really enjoyed the discussion. It really spoke to something I was thinking about back in the fall and something that came up recently in a job interview. I was interviewing at a software company for job that was going to be very much focused on direct marketing, particularly email marketing, which something I have a strong background in. The interviewer asked me what "levers" I believe that I can pull as a marketer. My answer centered around segmentation, offer, presentation, pricing and the like. He countered that he liked to think of it as audience times response. So if you need more sales, just get a larger audience or increase the response rate. I replied saying that I felt that it was too simple to look at things that way because you're forgetting that not everyone is going to respond directly to the promotion. Essentially, you are forgetting about the entire marketing ecosystem that exists out there, which is something that if you're using analytics, you can actually see. For example, I worked at a company and we noticed that email marketing campaigns led to increases in search volume... meaning, email recipients would receive the email and then to a search engine to find the company or search for products. I suspect in some cases, they might have been looking for deals elsewhere (hence why you need to have your channel strategy well planned out in advance folks). And that's why I really enjoyed the discussion on that particular episode of the Beancast... the panel was talking about how marketers are all too quick to think about direct marketing something as simple as audience times response rates. I think these marketers are the same ones that often play really loose with permission levels. They say to themselves "hey, if somebody isn't an open or a click or a purchase, the message didn't register and I can hit them up again next week". This is the type of attitude that I think is all to pervasive in marketing and one that I believe gives the field a bad name. Worse, who wants to work at a firm that likes to market itself in this manner? I went to my first Marketing in Ottawa Meetup today. The group is organized on Meetup.com and is made up of people in Ottawa that either work in marketing or run a business and need marketing help. There was only about seven people there but everyone seemed to have a slightly different background and that is what makes these things so interesting. You never know what you're going to hear or what you're going to pick up. After spending time studying marketing at the MBA, I found that I really enjoyed talked about marketing strategy at a more grass roots level. In formal marketing programs, you often talk about marketing with large budgets (or at least some budget). When you get in the room with small business owners, you are often talking about marketing with NO budget. On top of this, you are often taking about marketing with limited expertise. For example, I may suggest that somebody set up a blog, and while this isn't too difficult, it does take some knowledge and time (money) to start. In the end, I just found that I walked out with a much great appreciation for what marketing really is to most of the people that do it on a daily basis. Elaine from Wild Pigments, an Ottawa art studio. Elaine teaches art to people of all ages. Caroline from Evolv. Evolv is a new fortified water product that increases stamina, energy and endurance. Judi from Judi's Studio. Judi has a number of things on the go from the Kids to Be and Me show, to a few other businesses based out of Judi's Studio. Marie from Trusting Yourself. Marie specializes in helping all sorts of people live better lives. Powerful stuff! The meeting was organized by Linda. Linda is an interior decorator. We also had a real estate agent in the group, which is always interesting as I find the real estate industry is one that is really embracing e-marketing and particularly social media strategies. Amie is a real estate agent who specializes in all kinds of property all over the Ottawa area. In all in all, it was a great lunch and I'm glad I got to meet and get some feedback from these people. Why Our Mobile Phone Pricing Makes Us Look Like North Koreans. I was reading the Ottawa Citizen business and technology section and the mention of a particular mobile phone and how it was priced really irked me. The write-up mentioned the Samsung Galaxy Spica (terrible brand name) at Rogers for $85 with a three year contract that carries a minimum monthly charge of $45. You can see what I was reading here. I get why phones are offered on a discount with a contract (so the service provider can make back the difference) but my issue with advertising phones in this manner is that it continues the practice of getting Canadians hooked on what appears to be cheap hardware. There are few places left where consumers have been trained to buy phones at discounts. In most other places, customers purchase the phone at full price and then shop around for the best deal in terms of network service. A good smartphone (and I hate the term smartphone) costs upwards of $500 dollars if it is unlocked. I did a bit of digging and found out that in the US, only about 5% of phones are sold unlocked. Worldwide it is about 50% but as high as 80% in Asia and 70% in Europe. If it is 5% in the US, I would imagine it is about the same if not less in Canada. I think the problem in Canada comes from the fact that when it comes to mobile phones, we are like the citizens of that fateful nation North Korea. In North Korea, Kim Jong Il has them so brainwashed, they believe they live in the best place on earth. No, really. It would then appear that in Canada and US, we have also been lead astray because we have no concept of the true cost of a mobile phone. We just take what we read as being true. How can the media get away without reporting the true cost of the hardware and why do they have to quote it at the 3 year contract discounted rate? I believe the answer to that is quite simple. The network operators strike exclusive deals with hardware manufacturers for phone exclusivity. Because Rogers is the only one offering that phone, you have to get it through Rogers and are then able to quote "their" price with a contract. Once Canadians get locked into their service provide, it's over. The network operator can provide you with poor customer service (that we complain about) and you have no choice but to stay with them or pay a penalty for leaving your contract. I just hope more Canadians decide to stop taking these types of practices sitting down and instead give the operators feedback with their feet.... by walking somewhere else and getting better service or by purchasing unlocked phones. I was glad to hear about Google's plans with the Nexus One to offer it unlocked and I hope that it begins a trend here in North America. Let's hope for all of our sakes it does! I read an article in the Financial Post recently about the Public Mobile launch that caught my eye. There were two things interesting about the article to me. The first was that Public Mobile is launching without an operational network and if you sign up early, you can get unlimited in Canada calling. The second is that Ted Rogers gave some advice to the Public CEO that I think is dangerous to listen to. "Ted said to me," recalled Mr. Krstajic, a veteran in Canadian telecommunications circles and former Rogers Communications Inc. executive, "don't let technical issues with the engineers stop you from selling." I think that following Ted Rogers' advice in 2010 could be detrimental to the image and therefore future of WIND Mobile. Here's why: when the mobile industry was new, it was a novelty and a luxury for most people. Even as far back as the year 2000, when mobile was starting to gain mainstream acceptance, mobile phones were still something being used by early adopters. I think that early users of mobile technology were more accepting of issues with networks than they are now. Just look at what is happening to WIND after their launch. Add to this that customers in 2010 are more connected and able to share the nightmare of bad experiences (think about what's been happening AT&T in the last year with their network issues) and you have a recipe for disaster. I believe that when it comes to mobile technology, users want a great customer experience and have come to expect it from the handset through to the network. Even in our home connections are not lightning fast, we still want them to be. And this means that we want our mobile experience to me quick too. We don't want to wait for applications to launch and we don't want to wait to get service before we make calls. I just think what might have been true for Ted Rogers then isn't so true anymore. The article goes on to say that Public Mobile doesn't have network issues and are taking the time to make sure it is 100 percent so it appears as though they get the pressure they are under. Let's just hope they deliver as our mobile industry is dominated by Bell, Telus and Rogers who together own 95% of the market. I have been thinking about this one for a while. I suppose the debate happening in the Canadian House of Commons about euthanasia got me thinking it was time to post about it. I'd like to propose an end to ambiguity. We should hunt it down and offer a bounty on it. Ambiguity is the single biggest threat to our productivity and our way of life. Every single day, ambiguity and the need to eradicate it from our lives forces us to waste large amounts of our time and effort (and by extension $$$). I am not proposing that we stop brainstorming or sharing ideas but we must ensure that people are always concerned with ambiguity. Ask yourself "What's next? ", "When? ", "Who owns this?". Nail it down and then write it down and make sure everyone understands. But that is just the beginning. I can't tell you how often people fail to share the fact they have made a decision. You ask for something, somebody makes a decision on it but never shares the answer. Maybe they are afraid the answer is NO. Maybe they are afraid the answer is YES. As long as I know the answer, I can move forward. Without an answer, I stuck calling or emailing you back an hundred times to find out. Without an answer, I am forced to keep you in my inbox. Without and answer, I am forced to keep you in my "world". Perhaps if we focused a little bit more on getting rid of ambiguity, we'd all have more time to do the things we really love in life. When a telemarketer calls (which happens rarely these days), I don't waste my time (or theirs) making them go through a long speech only to say that I'm not interested. I tell them I'm not interested and move forward. If a potential supplier is trying to sell me something and I am not interested, I may ask for more material from them but then I don't ignore their follow up emails and phone calls. I tell them that I have reviewed the material and decided against moving forward. No harm, no foul. Think of all the time we'd have back over the course of our lives if we put as much effort into getting past ambiguity as we do in trying to slack off and hide from giving answers. The movie of choice was "She's Out of My League". The movie stars the Canadian Jay Baruchel and a host of other great character actors. It is the story of a airport security guard and typical loser named Kirk who meets a girl named Molly, widely described as being a "10". Seeing as this is a romantic comedy, you can pretty much guess how the plot goes. Done by the same people who do movies like Knocked Up, you can imagine what kind of humour it is... real, honest and disturbing. There are a few interesting things about this movie. One is that it is based in Pittsburg... and unlikely location for a movie but it really works. I have always heard that although Pittsburg is a very blue collar town, it has amazing architecture and a fairly vibrant restaurant/arts scene. It is even home to the Andy Warhol museum. Who knew? The other interesting thing about this movie is that I believe it is really about how the biggest thing that gets in the way of relationships is how we view ourselves. Obviously, Kirk (Jay Baruchel) thinks that he has no business being with a girl like Molly... and that is what ultimate causes the friction between them. So I think the message of the movie is believe in yourself and take chances as you never know what will happen. Maybe that frog will turn out to be a prince or princess. Of course, it is also worth mentioning that there are great performances by supporting actors in this movie and their solid comedic timing and delivery makes even the smallest of scenes so funny you'll have tears coming down your face. Do you need to rush and see in the theater? Maybe. Should you see this movie? Definitely. Podcasting has been around for a while now but I still talk to people who don't take advantage of the great things you learn from all of the great podcasts out there. I like to think that podcasts help me "monetize" my spare time. Instead of sitting on a bus looking out the window, I can be learning about something new. There are many different ways for you to listen to podcasts. One way is to find a podcast and manually download the mp3 or you can use a media player like iTunes to manage your subscriptions. Most podcasts will also have websites that have a media that you can use to listen to the podcast off the webpage, and some people find this easier. Now that I have transitioned to the iPhone, I like to use iTunes to manage my subscriptions so that they can be synced easily with my iPhone. If you aren't using something iTunes of Zune to manage your subscriptions, I would recommend you see if there is an email newsletter or RSS feed to alert you to new episodes. Here are some of the podcasts that I listen to regularly. First I'll thrown some out with different topics and then list from marketing/communications ones at the end. The Advanced Selling Podcast: Hosted by Bill Caskey and Brian Neale (who I believe is a college football referee) this podcast is great for anyone who wants to know more about sales. However I also think that this podcast has applications outside of sales as they often discuss attitude and motivation. Check out this great episode on having an abundant vs scarce attitude. Engadget Mobile Podcast: Few industries are as exciting and dynamic as mobile. Rapid innovation and fierce competition mean that we are constantly seeing new products. At the same time, device manufacturers and carriers have large marketing machines pumping out all kinds of confusing rhetoric. In the middle you have the Engadget Mobile podcasting team that includes a Canadian (Sean Cooper from Ottawa) making sense of everything that is going on. I don't have time for an extensive amount of mobile podcasts so this is the only one and believe me, it is quality. Warning, it can get a little technical at times but there is lots of great product strategy talk as well. Grammar Girl Podcast: I know, I know... it doesn't seem like it but I do like to try and improve my writing skills as much as possible and this podcast is a must for anyone who ever wanted to "who or whom?". Part of the Quick and Dirty series, each episode is only about ten minutes long and focuses on only a few issues at a time. This Week in Tech (Twit): Hosted by Leo Laporte, this tapes live as a netcast on Sunday afternoons but I usually listen to it on Monday. Usually over an hour long with four guests but I have to say that this is the only real technology focused podcast I listen to because I think you get a bit of everything from mobile phones to computers to almost anything else related to tech in one podcast. It can push an hour and 20 minutes and there can be long periods of useless banter but it is for sure worth your time. The following podcasts all deal with marketing and/or communications. I believe that never before have these two disciplines been so connected and intertwined. As such, many of these podcasts discuss both and are great listening for anyone in either field. Inside PR: Great podcasts hosted by fellow Canucks Terry Fallis and David Jones. Usually updated on Wednesdays, this podcast is usually around 20 mins and includes discussions that center around pure PR and social media. The Beancast: You get a little of everything on the Beancast each week. Tends to run over an hour so the discussion will often be in depth and feature three or four different panelists. One of my favorite podcasts. Marketing Over Coffee: My favorite marketing podcast, MOC is actually recorded each week in a Dunkin Donuts shop at about 6am. Usually posted on Wednesdays or Thursdays, MOC tends to sit around 20 to 30 minutes and includes lots of talk about e-marketing. Six Pixels of Separation: Hosted by Mitch Joel, this (again, Canadian) podcast talks about marketing and communications. Tends to run about 45 minutes or so and will have Mitch and one other guest. Discussion is often centered around only one or two main topics each week. This podcast tends to make think deeply about ideas. Duct Tape Marketing: This podcast says it is for small business but I think the topics of discussions here can be applied to ANY business. John Jantsch is very well known for his business and marketing acumen and the Duct Tape Marketing brand is known worldwide. Short episodes of about 20 minutes on one topic with one guest. If you have podcasts that you think I'd enjoy, let me know as I am always looking out for new ones. Perhaps the best part of the Oscars for me was the tribute to the late John Hughes. I'm not going to link his name to a Wikipedia entry because if you don't know who he is, you are out of it read this post. I will say that "Ferris Bueller's Day Off" is a classic and that I always at least a few minutes of it on AMC. It's funny to think back that Ferris was upset at getting a computer instead of the car that his sister got, when you think about what his hacking skills could be used for in 2010. What is interesting about that tribute was the inclusion of Judd Nelson. Judd is best known as John Bender in the iconic movie The Breakfast Club, but hasn't really done much in years. Anyways, Judd decides to show up at the Oscars looking like a dog's lunch, causing a huge stir online. Perhaps the best part of the story is that it has since been picked up by mainstream print media and they decide to use a picture that, in my estimation, isn't even from that night. Here is the print piece with picture. And here is an US Weekly picture from the article above that is from the Oscars. Unless he showered and got a haircut backstage (afterall, this is the Oscars), something funny is going on. Regardless, I have to say that Judd (I feel like I know him after seeing all of his movies) failed to capitalize on the huge TV audience to re-launch his career in the mainstream (yes, I know his IMDB lists recent credits). I went through my days of having long hair. I don't regret them for even one second but I have to say that at some point, you have to realize that image does come into play in your career and showing up somewhere looking nice means something. I wish that wasn't the case and I wish people didn't make such a big deal about appearance but I don't think showing up in front of billions looking like that helped much. Then again, if you have all of the world talking about you, did you really lose? Now that the games are over, it's time to take a few minutes and reflect back on two weeks of great memories. I am lucky enough to be working from home, which meant that I was able to keep a good handle on what was going on each day. There were a number of things I found interesting about the 2010 Olympic Games coverage. You can't watch TV for more than an hour. TV is no longer designed for long periods of viewing. I have the (mis)fortune of being able to work from home. This means that I can keep the TV on in the background as I work. During the Olympics, I was able to keep my TV tuned to CTV for the majority of the day. I guess the point I am trying to make here is that I was exposed to HOURS and HOURS of Olympic TV. The problem is that TV is no longer made to watched like this. I kept seeing the same pieces over and over. A story about Difference Makers (hosted by Rick Hansen) was shown about two hours. Events I had watched live were replayed over and over. It is understandable given the state of media that this is the case but I have to say that the quality of the production itself is far below the quality of the game themselves. For more thoughts on the games, check out Molly Woods' take over at her CNET column. The TV ads were ridiculous and annoying. It seems that three or four different companies paid for all of the TV advertising because I kept seeing the same ads over and over. Canadian Tire, Tim Horton's, Quebec, British Columbia... that I simply became annoyed with the ads, just like I did with the "I Believe" song. It seems that frequency = relevancy = resonance in the minds of the TV stations. Exhibit A: The Tourism BC ad. How can you advertise "you gotta be here" when the people in ad are clearly not actually in the locations they are shown in?? Exhibit B: The Quebec Tourism ad. Great imagery but it is the cheap song that is a rip-off of the Price Is Right song that really got to me after day 2 of the games. More to come as I can find them on Youtube. Some ads were amazing. This CTV ad with Michael J. Fox was AMAZING. Timely, relevant and very emotional.